How Early In The Season Can Pythagorean Predictions Be Made? The next stage for developing my refined version of the Pythagorean equation (known as the MPE) is to characterise how much data it actually needs to make accurate football predictions. To investigate this I selected Manchester City, Swansea City and Wolverhampton Wanderers from the English Premier League’s 2011–2012 season. The reason for choosing these teams was that they represented the top, middle and bottom of the league so I could test the MPE equation across teams of varying quality and league position. I then used the MPE equation to predict the total points at the end of the season for each team week-by-week to see how the prediction changed throughout the year. Figure 1 shows the difference between the predicted points and the actual points achieved at the end of the season for each of the three teams. The prediction settled down very quickly for Manchester City and from match three onwards the root mean square (RMSE) of the error was just 1.96 points. This means that after just three games the MPE equation was accurately predicting how many points Manchester City would have at the end of the season to within two points. For Swansea City the prediction was slightly more problematic as they didn’t score during their first four matches and the MPE equation needs goals to have been scored before a valid prediction can be made. Swansea City finally scored in their fifth match in a 3–0 victory over West Bromwich Albion and from then on the prediction steadily improved and was within three points of their actual total after their next six matches. 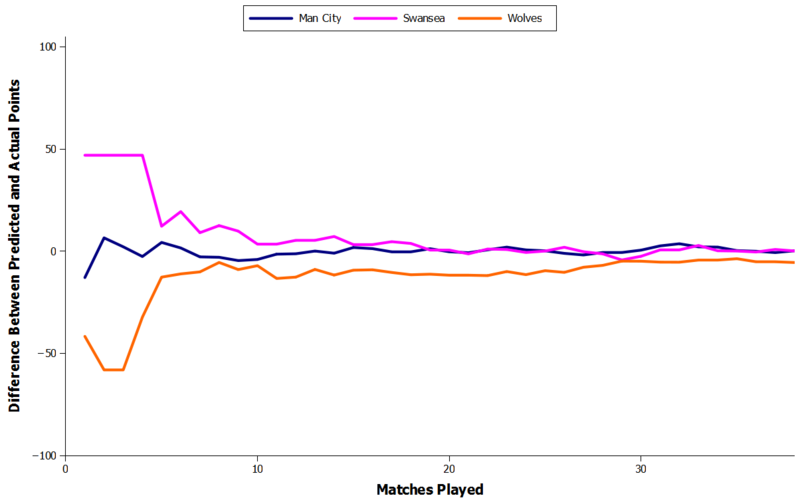 Wolverhampton Wanderers’ season was an interesting one to predict as they had a very misleading start with two wins and a draw in their first three matches giving a predicted point total of 83. At this point though it all went disastrously wrong for them and they lost their next five matches on the run by which time their predicted points had dropped all the way down to 30. Wolverhampton Wanderers eventually finished bottom of the league with 25 points. Overall, the MPE equation appears to give stable results and the only real requirement is that goals have been scored. Based on the data in Figure 1 accurate predictions can be made early in the season as there is very little change in the predictions from week ten of the season onwards.